This canvas is #428 and comes in a Thomas Kinkade antique gold frame. frame with cranberry matting. The sketch is also handsigned by Thomas Kinkade on the back. "Sunset at Riverbend Farm, my first published depiction of a working farm, and the initial print in my Riverbend Farm collection is a lovely pastoral. This picture of peace and prosperity is enlivened by milling cows returning to the barn at evening, and flocks of geese and ducks that ford the pristine stream." Sunset at Riverbend Farm copyright© 1995 by Thomas Kinkade is prohibited from being copied. Thomas Kinkade art, sunset at riverbend farm, farm paintings, Sunset at Riverbend Farm, Riverbend Farm I, pastoral art, Sunset at Riverbend Farms, pastoral scenes, barn, farm, barns, farms, Thomas, Tom, Thom, Kincade, Kincaid, Kinkaid, Kinkade, art work, canvases, images, paintings, pictures, and prints of Sunset at Riverbend Farm by artist Thomas Kinkade for sale. 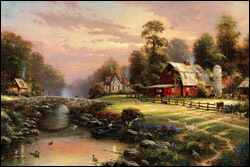 Sunset at Riverbend Farm painting by artist Thomas Kinkade can be purchased in art print or canvas form at special sale prices at Christ-Centered Art.